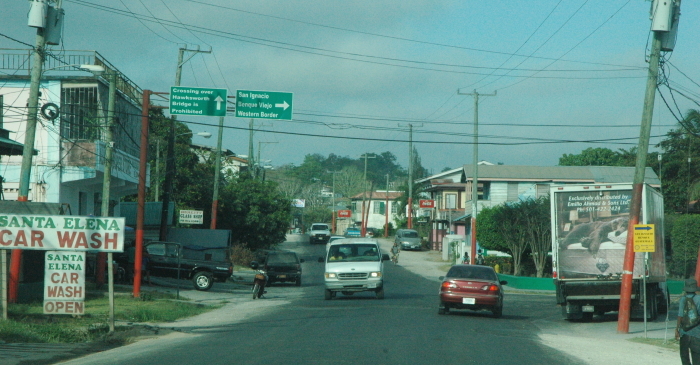 While the Belize villages were larger, and are supposed to be more prosperous, there really did not appear to be much difference. To my eye, both were poor, with a badly maintained government infrastructure. Nor is this surprising, considering that the governments of both countries are considered very corrupt, an opinion confirmed for me by the many stories I heard during the week about how the leaders in those governments manipulate the system to generate money for themselves while doing little for the public they are supposed to serve. It is this corruption that makes it difficult for the locals in both countries to prosper. The law does not work to help them. On a more positive note, visiting these countries is not as dangerous as you are led to believe. In addition to being forced to hire a guide and use a Guatemalan vehicle, before heading to Guatemala we received numerous warnings: Don’t carry much cash, don’t walk about by yourself, don’t talk to strangers, watch your back, leave your wallet home, etc. 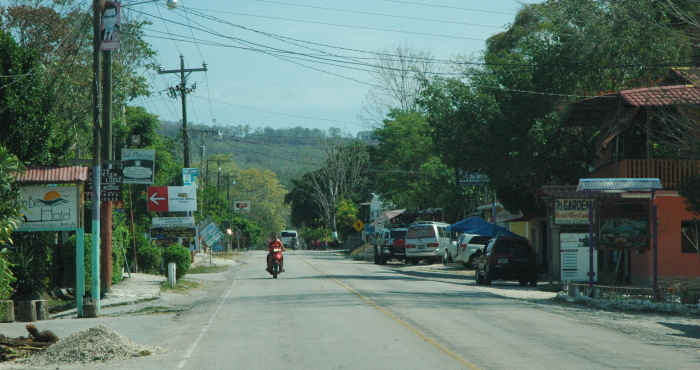 Yet, despite this my sense during my visit was that Guatemala was no more dangerous than walking the streets of New York: generally very safe but requiring a common sense awareness of what is around you. 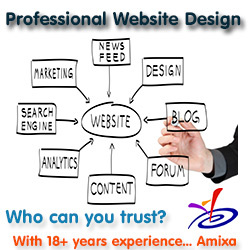 As a result, there really was little need for us to worry. For example, when we got to the central plaza of the Tikal ruins our tour guide released us to wander about for an hour on our own. Often we were alone in the ruins, with nothing to fear. The ruins themselves were as impressive as those I saw in Mexico in November, though different. The pyramids in Mexico were very large and spread out. In Tikal the pyramids and temples were smaller, but there were a lot more of them much closer together. 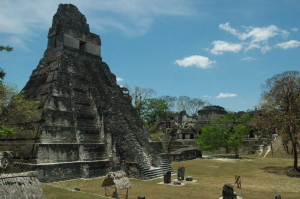 In fact, only about 20% of Tikal’s structures have been restored. 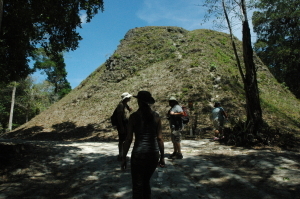 The rest remain buried below jungle growth, like the pyramid on the right, and will likely stay that way for the foreseeable future, partly because of lack of money to pay for the archaeological work to uncover them, and partly because leaving them covered protects them. Like Mexico, the Tikal Mayan ruins were built to project to the citizens the power and glory of their leaders. 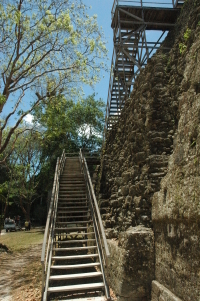 Like Mexico, we were allowed to climb some of the structures, though in most cases we did not walk directly on the stones, but used wooden stairs, such as those in the photo on the right, built to ease the climb as well as keep the heavy pedestrian traffic from damaging things. And like Mexico, Tikal had several different types of structures, with the two most prominent being temples and pyramids. 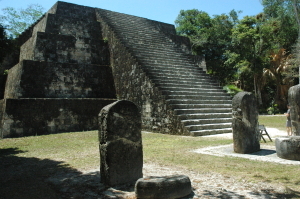 Pyramids, as seen in the photo on the left, are smaller, with flat tops and stairs going up on all four sides. There are a lot of them, most of which remain buried. According to our tour guide, they were used to observe the sun, the planets, and the stars in order to mark the passing of the seasons. Temples, as shown on the right, are fewer, but much larger, built by the rulers to commemorate their rule. Each has only one stairway to the top, and at their peak is a building, a temple, reserved for those rulers alone. Most of the largest have been restored, or are being restored. In the photo below you can see some protective tarps and scaffolding on the top of the rightmost temple, evidence of the on-going restoration work. 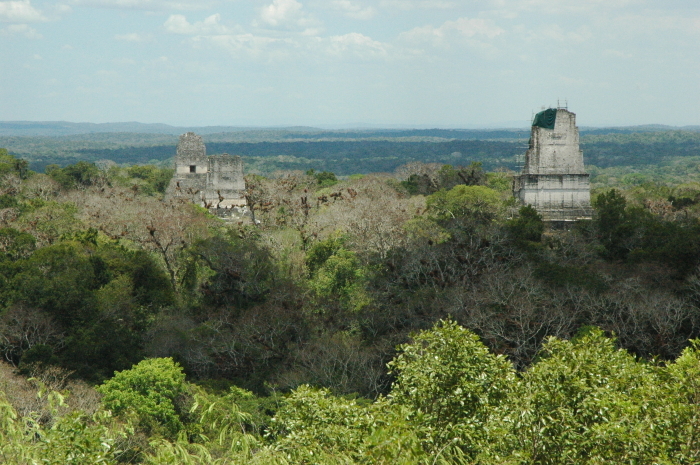 This image was taken from the top of the largest temple at Tikal. You might find that the view seems familiar, but not because you’ve seen it in travel posters, but because George Lukas used it as a backdrop for the rebel planet Yavin IV in the first Star Wars film. As I stood at the top of the tallest temple looking out at the jungle with only those few other temple tops visible, I realized that this place once looked very different. When Tikal was at its height, the jungle would have mostly been gone, and the many now-buried buildings would have been exposed and maintained, with a large populace, estimated to have been more than 120,000, rushing about as city populations normally do. Such are the ways of empires. Focused on power and their rulers, they in the end do not really build well. In the end, they result in a poor nation, unable to sustain its citizens, who eventually exercise their freedom (no matter how denied) and leave for greener pastures. Woe to us if we follow this same path. We’re on that path, and have been for some considerable time. I can’t help being the optimist, even though the evidence is clearly saying we are going in the wrong direction. Interesting story and pictures Robert. Thank you.